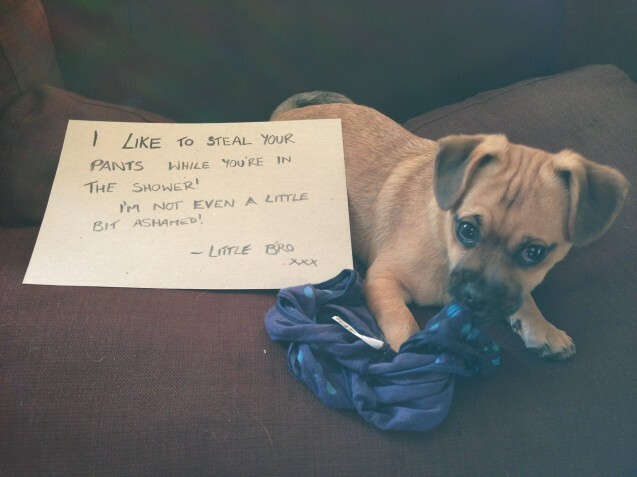 Brover is a master pants thief. If you leave the door unlocked while you’re in the shower, it doesn’t matter if your pants are tangled in your trousers or up on the toilet seat, he will find them and steal them! Posted August 14th, 2013 . I cannot STAND how cute this puppy is! I rescued my puggle at age 1-1/2. He’s still incredibly cute, but OMG what a puppy he must have been! My girl doesn’t do that. She waits until she has a chance at a bra that costs 10x as much so that she can really hear the howling when I chase her.